We are still enjoying the harvest. The parsnips have been a particular success but, as they are so deep-rooted, they need hard physical labour to lift. Fortunately my daughter, Zoë, was on hand to assist. 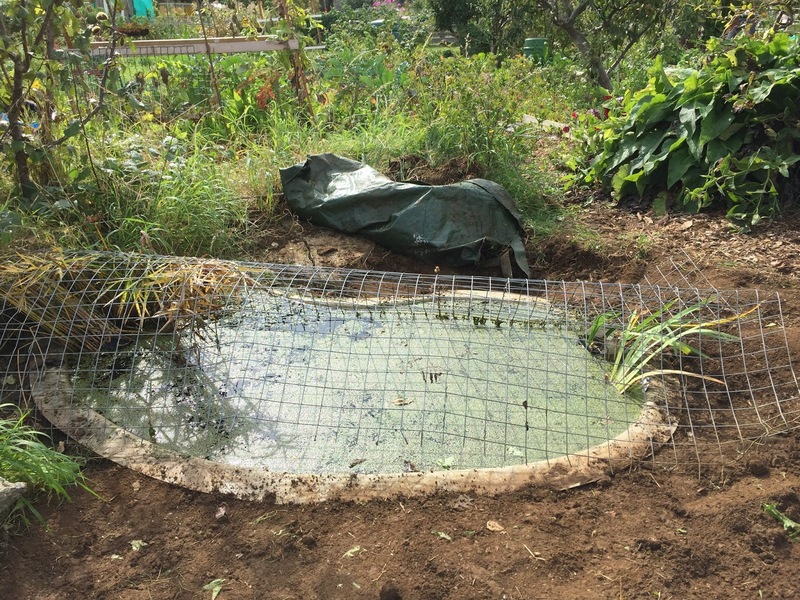 We also have a pond which could hardly be seen under the couch grass and weeds. I decided now was a good time to clear the area and we have planted some aquatic irises in the pond. Whilst clearing the undergrowth we were greeted by a very large frog who hopefully is helping to keep some of the pests under control. ‘The roots or leaves boiled, or the juice of either of them, or both made into an electuary with honey and sugar, is a safe and sure medicine to open the pipes and passages of the lungs’. Perhaps we should harvest them first before digging out the roots. I am told that the leaves are nutritious and can be cooked like spinach (and of course there is nettle beer). But other parts can be used in a variety of ways. Although nettles are wind pollinated and reproduce by production of seeds, they also reproduce asexually, spreading by stolons and rhizomes which are modified stems; stolons spread across the surface as runners whilst rhizomes spread underground. This is why they are so effective in colonising large areas and why they need to be removed if they are not to take over the entire plot. We still need to erect our shed, so I think that we might be too busy this autumn to find time to do something with the nettles apart from composting them. The good news is that their presence suggests that the soil is rich in nitrogen and phosphates. We will probably leave a patch at the end of the plot as they are important in encouraging beneficial insects. Many caterpillars and aphids feed on them and may prefer them to my vegetables! They also attract ladybirds which are welcome on the alloltment. We can think about recipes next year!